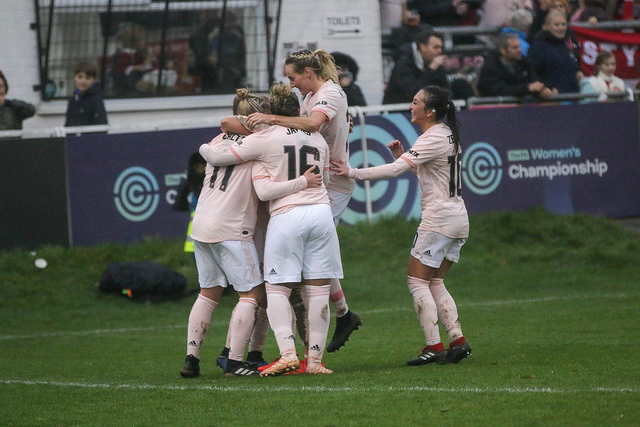 Manchester United continued to ransack the league, hitting the London Bees for nine as chasers Charlton and Durham drew with each other as Tottenham picked up a timely win away to Sheffield United. Elsewhere, Leicester registered their own timely success against an inconsistent Lewes after Crystal Palace saw off Millwall. A goal up early on courtesy of Chloe Burr, the Eagles doubled their advantage after the break when Hannah Mackenzie turned the ball home at the far post. Having been forced into putting Burr in goal following an injury to Shanell Salgado, the former shot-stopper showed her experience to keep the Lionesses at bay until she was beaten by a perfectly executed chip from Gabby Ravenscroft. With Ravenscroft looking lively throughout the match, Palace were more than happy to see Gemma Bryan’s header ripple into the net to give them a much-needed cushion to see the game out. With both sides breathing down Man United’s neck, the potential three points on the line would have been huge for either, a draw possibly only benefiting Spurs. Gifted the opener when she pounced on a poorly timed back-pass, Ellie Bailes opened her account for the season half way through the first half before a quick-fire Zoe Ness brace had the Wildcats up at the break. The real drama saved for the last five minutes as the hosts equalised through Charlotte Gurr’s close-range header before clearing the ball off of the line twice in the dying moments. Needing just two minutes to undo their opposition, Charlie Devlin fired United ahead seconds into the match when Mollie Green’s effort cannoned off of the upright at her feet. The floodgates opening after a well worked free kick routine that saw the ball pinged across and through the box for Ella Toone to poke home just before the half hour. Two became three ten minutes later when Kirsty Hanson laid the ball across the box for Lizzie Arnot to nudge over the line at the back post. Green made it four seconds later when she hammered the ball beyond Sarah Quantrill from the centre of the box. The rout continued after the break, Devlin the first to complete a brace when her shot squeezed through Quantrill’s gloves before Toone bagged her second of the afternoon. At six the hosts didn’t look like stopping and only needed another two minutes to find a seventh as Lauren James charged into the box and eased the ball home, the substitute picking out the bottom left corner five minutes later. The gloss put on by Katie Zelem ten minutes from time as she converted her fourth penalty of the season, clinically firing the ball into the bottom left. 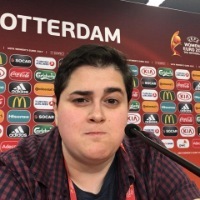 Two teams looking to hit the ground running and mine some better form this year, it was Leicester who found the breakthrough just before the break when Melissa Johnson fired Freda Ayisi’s cross home from point-blank range. The Foxes extended their lead five minutes after the break when Fiona Worts’ hopeful effort arced over Faye Baker, dropping into the net like a stone. Worts made it three just minutes later when she swept the ball home from the left before Lucy Johnson rounded out the scoring with a bullet from 16-yards. A goal to the good five minutes in when Rianna Dean claimed her tenth of the season, turning Sarah Wiltshire’s rebound home but the hosts found instant parity when Jenna Schillaci diverted Veatriki Sarri’s cross past Chloe Morgan moments after the restart. Still chasing down the table-toppers, Spurs showed their class with a moment of genius from Wiltshire as she nodded the ball over her marker before smashing it home on the half-volley.